This contempory church wallhanging contains five signs of Jesus Christ. 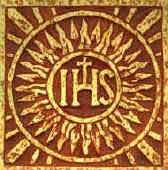 The IHS sign of "Jesus" is formed from the first three letters of his Greek name IHSOUS. The crucifix mounted on the bar of the letter H represents the cross on which he died. The gold circles, flames, and rays represent the radiance of the Sun. The large gold X in the background represents the first initial of his Greek title CristoV meaning "Christ."